Urban domestic gardens occupy a substantial proportion of the area of British towns – about 20-25% according to a study in Sheffield. They are a notable resource for wildlife and full of interesting plants. In summer 2016 we developed a protocol for recording species in gardens and tried it out in four. In the two subsequent seasons we recorded 40 more gardens. 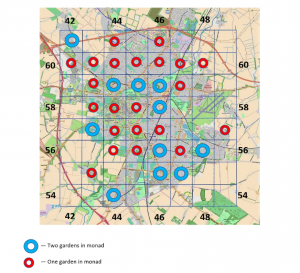 Not more than two gardens are sampled per monad (1-km square). We are always glad to find new gardens to survey and aim to record 16 gardens in 2019, to bring the total to 60. In each garden we note the weeds in flower beds and all species in the lawn. We ask the householder to tell us of the vertebrates that they have seen in the past two years. We ask the householder for information about management, in particular pest control and wildlife management. We make records of (1) Vascular plants (summer and early autumn, including a separate list for the road verge outside the property) and (2) Mosses and liverworts (autumn and winter). The last garden for 2018 was on 22 October. There was a fully developed rosette of Bee Orchid Ophrys apifera in the lawn, but in October, some early bloomers such as Lesser Celandine Ficaria verna and Ivy-leaved Speedwell Veronica hederifolia would have been invisible. As part of the plant recording we take soil samples and note the weeds in two squares of size 1 m² placed in flower beds. This diagram, based on Open Street Map, with Duncan Mackay’s overlay showing the National Grid, shows the monads which we have surveyed. We need gardens in the blank monads and in those with red circles. Click on the map to enlarge it. If you want to survey your own garden here is the Garden_Survey_prospectus_&_form . The last garden of 2016 was sampled in October, and we were interviewed for Cambridge TV by a team led by Jamie Wyver. This had no flower beds but lots of bushes and trees with berries. Of course, there is no such thing as the average garden. If you have a garden that you are willing for us to record, or if you would like to join the garden survey team, get in touch with us at NatHistCam@gmail.com .